A draft Master Plan for the Yanchep Lagoon has been prepared to guide future development, activities and amenities in the area as a way to provide vital services and community activities for local residents and visitors to the area. The draft Master Plan can be accessed in the ‘Documents’ section below. The Plan was developed following extensive community engagement late in 2018, which included an online engagement period, followed by a three-day Planning and Design Forum involving community and stakeholder representatives and a Community Open House on 17 December 2018. Council endorsed the draft Master Plan for comment at its 5 March 2019 meeting. The six-week public comment period is now open and closes on Friday, 19 April 2019. To develop the Yanchep Lagoon Master Plan, more than 70 people - including local community representatives - participated in the Yanchep Lagoon Planning & Design Forum, held in Yanchep on 28-29 November 2018. The Forum was open to a representative sample of stakeholders and community members who were personally involved in helping to shape the future of the Yanchep Lagoon Master Plan. Further sessions were held with City staff and Elected Members on 30 November and 1 December 2018. A Community Open House was held on Monday, 17 December to present the outcomes of the Forum at Splendid Park, (Yanchep Active Open Space), Marmion Avenue, Yanchep. In addition to the online form, you are invited to share your thoughts on the draft Master Plan with the public through the Submit Your Comments section below. The ideas and feedback captured during the digital engagement phase can still be viewed via our interactive online map. The online survey results are now also available in the documents section on this page, along with the Draft vision and Master Plan. Thank you to everyone who contributed to the project so far and those who represented the community in the Planning Design Forum. Consultation is now open on the The Yanchep Two Rocks Local Area Plan, which will further complement the work conducted collaboratively between the City and placemaking consultancy RobertsDay on shaping the future of Yanchep Lagoon. See full details in Your Say. Although Yanchep started out as a remote coastal town, Perth’s continuing growth will see the area ultimately become part of a thriving metropolitan corridor that stretches from the CBD to Two Rocks. With Yanchep now one of Perth's fastest-growing suburbs, this change is already well underway. As more residents and businesses move into the surrounding area, we need a plan for the Lagoon that preserves the things that make it unique while also unlocking its full potential as a great coastal destination for everyone to enjoy. To achieve this, the City is progressing the Yanchep Lagoon Master Plan, which sets a framework for future development and activities at the Lagoon. Tuesday, 5 March 2019 - Report went to Council on Yanchep Lagoon Master Plan and approval given for public comment on the draft. 8 March 2019 to 19 April 2019. A three-day planning and design forum on the Yanchep Lagoon area has been facilitated by the City of Wanneroo. The City of Wanneroo is undertaking an extensive consultation process to develop a clear vision for the Yanchep Lagoon area and is inviting the community to get involved. A first draft of the Yanchep Lagoon Master Plan can now be viewed on the City of Wanneroo’s website following a three day planning and design forum held in Yanchep late last year. Please refer to the City's Rules of Engagement before submitting a comment. Extensive master plan with great ideas. Consideration needs to be given to parking and public transport routes. On hot summer days the present car parks are overflowing. Please don’t change bus routes and run them through local housing in Capricorn. Please don’t ruin Capricorn frontage with car parks. Many countries use park and ride options. A corner petrol station will ruin the proposed area of development. Very excited about the overall proposal and considerations to date. Coastal Walking/cycling trail from lagoon to two rocks marina. The recent improvements have been good but are sufficient and have enhanced a beautiful area. The new petrol station should not be allowed as it is unnecessary and is in a totally inappropriate site. Lagoon noted 1of10 most pristine places in world,no longer noted. No more Buildings at Lagoon. Reno&keep character of Lagoon Cafe. Removed: Rocks and Dunes Lagoon Sth. Sand dune and Fisherman's Cove for a building and car park.Two mini beaches Sth Lagoon? The beach carried through past these, tide in still plenty of beach area in these spots. Sand creating a bar at the & filling in Lagoon, not as deep, outlet narrower. Perhaps structure of Lagoon being changed wind is free to do what it wishes. High wall, Cliff like affect?The visiting food vans are a good idea. Weekly summer markets at the lagoon fisherman’s hollow, bring a freo vibe to the coast, people forget the monthly markets and it’s not regular enough for fresh food. If it was weekly people would go more often. No petrol station at the back of the Lagoon. Don't ruin this beautiful spot. A sea pool incorporated Lagoon. Jetty with an underwater Aquarium- hire canoes, paddle boats. No Highrise building on the beach side. Tourist shops restaurant cafes. SLSC no higher took away view of the Lagoon. Whale watching/viewing tower skate park walk trail bike paths. Events held Sculptures by the Sea fireworks events for Australia Day. More parking. A small Maritime Museum. Significance to the Indigenous People of the area- Art Sculpture. Something to tie in with the Yanchep National Park. But please not too much removal of natural bush land on the Beach side of the Lagoon. Yanchep has been developed in some areas but neglected in others. The area is already densely populated by Housing developments. Whilst Tourism would be the best route to help to conserve the natural features and offer much needed relief to the community in forms of Job Creation and creating a stable, sustainable community, it would require some sincere, serious, sensitive planning, to accommodate extra strain on utilities/amenities and on the local immediate areas. There is a need too, to create generous buffer zones against the already noisy town. We need more hospitality along oceanfront plus more parking.Preserve some bushland to keep the peaceful feel of Yanchep. Please no more developments for Yanchep as it’s perfect as it is. Soon there will be no coastal area where it’s the perfect get away for peace and quiet so please leave it alone and don’t spoil a good thing. Definitely need the lifesavers but could make the clubhouse look better instead of it looking industrial. Beach side cafe or tavern would be great also. Don't want a petrol station on corner of Two Rocks n Yanchep, although we do need one in Two Rocks. I have been surfing Yanchep at Rafts (lagoon), the Spot and Ders for over 35 years and slowly watched these breaks deteriorate over time as a result of excessive sand depositing on the reef over time possibly due to marina's, pipeline drains, rock groynes and beach developments. Where cray boats used to be able to anchor inside the lagoon in the 60's it is now questionable weather smaller craft could comfortably enter inside that area due to the build up of sand. Any further coastal developments should be scrutinized to protect what where currently have remaining. You should be aware that the lagoon is 'silting' up. I have been in Yanchep for 10 years, and have noticed the silting up, which has increased in the last few years. It needs to be investigated. It could come from the development of the pipeline into the Ocean at Romeo road, and other developments. The unique natural beauty of the Yanchep Lagoon coastal region makes it one of the jewels in the crown of the Western Australian coastline. This is obviously an environmentally sensitive area and culturally important to both the area’s residents and the tourists who come in significant numbers to enjoy its pristine beaches. These include the Lagoon and Fisherman’s Hollow beaches, which provide protected swimming for both young children and adults in a natural ecosystem, and beaches to the south and north that offer good surf breaks for beginning and experienced surfers. In addition, recreational and commercial fishing is also carried out along the coast. These are the reasons why I choose to make Yanchep my home and I believe that future development needs to celebrate these unique assets and, along with the Yanchep National Park, continue to build on the identity of Yanchep being a natural wonder on the metropolitan coast. Major commercial development should be planned and located in the designated city precinct with smaller hospitality businesses (coffee shops, wine bar/restaurant) and recreational parks and infrastructure (skatepark) located sensitively and unobtrusively within the Lagoon Precinct. 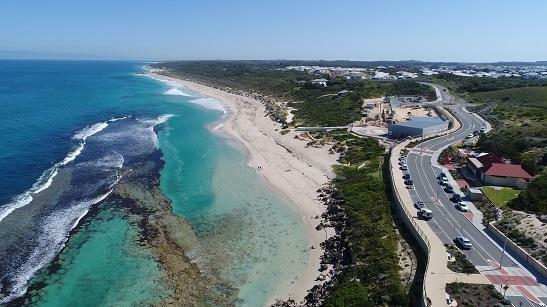 With careful and insightful planning, alongside intelligent local government policies, the Yanchep Lagoon Precinct can be developed to offer contemporary coastal services for the expanding local community as well as national and international tourists while also protecting the natural beauty of this very special area. Ideally, cafes & restaurants on the hill behind "Orion Cafe". Would have beautiful sea views. An ocean swimming pool further up from the Lagoon, with access from the northern side of the lagoon carpark or even further up near the old Club Capricorn Park. The old surf life saving club area could be a water park, but the car park would need to be expanded & in that case, would need direct access for the Transperth bus. Would be great if there was a brainstorming session at the Y.Hub, so the community could throw out ideas, and those with planning skills can assess whether those ideas are viable. For the lagoon maybe bar/restaurant but tasteful upgrade trying to leave the natural beauty of the coast line. A family Pub on the main roundabout near the shopping centre would benificial, also a type of adventure / skate park for the teenage kids as there is currently only the new football oval. No more Fuel stations. The area has so much potential for something really special - great tourism, food and beverage outlets and retail. An iconic destination for Perth residents! You are invited to share your ideas here or chat online with us or community members. Subscribe to receive City news including updates on projects. Use our Project Enquiry online form to contact us directly with any questions or comments.